In art, I search for the beauty beyond the flaws and imperfections and find inspiration in nature as well as the people around me." 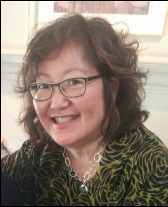 Nancy Peng has a degree in math from The University of Waterloo and blends her analytical skills and creativity in her approach to art and teaching. She enjoys the technical aspects of printmaking and teaches watercolour and mixed media painting at Button Factory Arts in Waterloo. She is a long time advocate of volunteerism and community engagement in Waterloo Region. Nancy is a co-op member and Marketing Chair of The Art District Gallery in Kitchener. Her art is held in private collections and has been shown at Homer Watson House and Gallery, Kitchener City Hall, Button Factory Arts, Waterloo Pubic Library, Harbinger Gallery and Scotiabank.